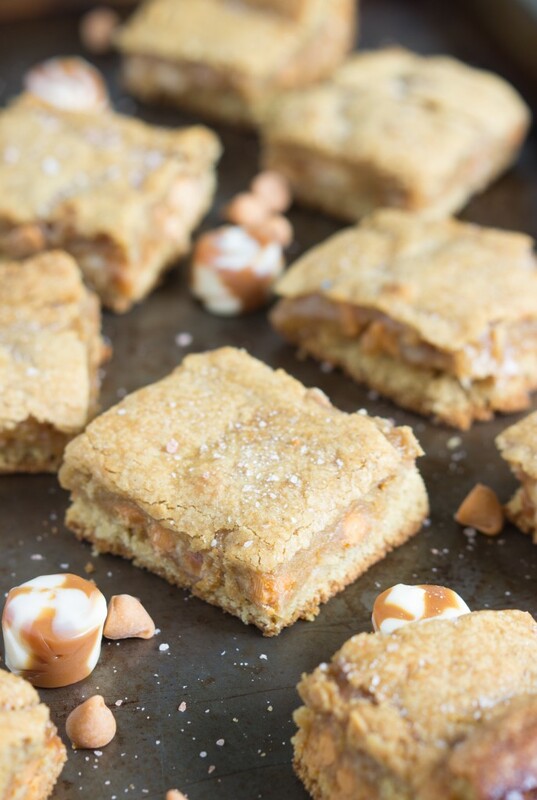 Salted vanilla-caramel and butterscotch cookie bars that are soft, creamy, and gooey. The perfect dessert to please a crowd! So, this week has been crazy!I experienced my very first tornado and (being from a dessert state in the West) was ill-prepared for the storms, rain, and thunder we’ve had the past week. Early last week my phone broke and so this past Monday I took it to the Apple store to get fixed. I had to use the GPS on the phone to get to the store, because, mind you, I have the intellect of an ant when it comes to directions. And that’s being generous. Anyways. Storms. So while I was waiting for the phone to get a screen replacement, my friend and I went to dinner and then did some shopping. When I went back to get my phone at the time they told me, they had closed early. Apparently all the storm warnings (that I was oblivious to) helped to make the decision. So (phoneless), we packed up and got in our cars. It had been raining the whole time we were shopping, but nothing too crazy. However, on the way to get to the car, I got completely soaked even under an umbrella. So I turned on the radio news to hear tons of storm warnings and was delighted to hear this tornado and heavy winds were right were I was at and heading towards my home. Delighted – that’s a joke. I was super scared. And then I remembered I didn’t even know how to get to this Apple store in the first place. So I’m driving, can’t see, spooked by warnings, and completely lost. Oh yeah, and the babe is crying. I feel super lucky though. I had a car high enough that it didn’t get stuck in the flood (small cars all had to pull over because they couldn’t drive through the pool ocean of a road), I found someone at a gas station that helped me find the right road, and I made it home safe after a couple of hours. I feel even more lucky that my house didn’t flood. My friend and her cute little babe have been staying over the rest of this week at my place since their entire basement flooded. They had to ripe out the drywall and carpet and lost a lot of things that were in storage. Needless to say (and if you’ve read this novel of a story – congrats!) I needed some serious sugar in my life. 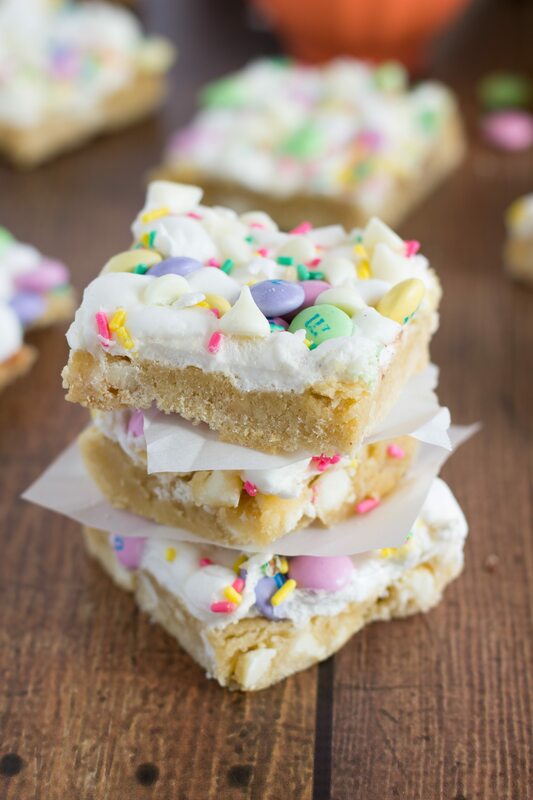 In the form of some serious stacked cookie bars. I’m talking, caramel and butterscotch, browned butter and salt. Oh yeah. These can wipe away flooding blues in a second. Or at least make the thunderstorms more bearable. These bars are un-real delicious. I attribute their “wow” feature to the caramels that are the main layer – they are Lancaster vanilla-caramel soft cremes. These soft cremes are the most delicious, melt-in-your-mouth caramels I’ve ever had. Luckily, the recipe only needs 25 of them, because the rest got shoved down in a hurry. Preheat the oven to 350 degrees F. Line an 8-inch baking pan with parchment paper and set aside. Remove all of the vanilla-caramel candies from their wrappers. Cut each of the caramels in half and then toss in a small bowl with one tablespoon flour to keep them from sticking together. Heat a skillet over medium heat. Slice the butter into 6 individual tablespoons and add the butter to the skillet. Whisk the butter frequently. When the butter melts all the way it will foam up a bit. Watch the butter carefully for lightly browned specks at the bottom of the skillet. Remove from the heat and immediately pour the butter into your mixing bowl. Browning butter can easily get burned so watch it carefully and make sure it doesn't get too brown or burned. If it does, you will need to start over. Beat together the browned butter and brown sugar. Beat in the egg, milk, and vanilla extract. Beat well. In another bowl stir together the flour, baking soda, and salt. Slowly add the dry to wet and blend until well incorporated. Spread about one cup of the mixture evenly on the bottom of your prepared pan. Sprinkle the vanilla caramel pieces over the batter. Sprinkle the butterscotch baking chips on top. Gently spread the batter over the butterscotch baking chips to cover as much as possible (the mixture spreads as it bakes so just try to make sure it is even on top). Bake 25 to 30 minutes or until the sides and top are lightly browned. Cool completely in pan on wire rack. Cut into bars. 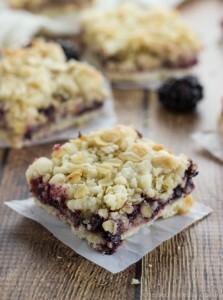 Want some more dessert bars? Chelsea, no kidding, I would’ve needed more than a little bit of sugar after that ordeal! Lost without a phone in a tornado warning – yeah, I think almost all of us would’ve had a mini flood of tears at that point. And you still manage to post these gorgeous bars! I love the salt on top, especially with the butterscotch swirls. Pinned! Glad you made it home safe in that storm! And I’m sure these bars were the perfect thing to help make you feel better. 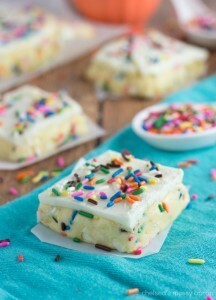 They looks so ooey-gooey-delicious, definitely on my list to try soon. Pinned! Oh gosh…that sounds like a nightmare of an ordeal! Glad you made it through it unscathed. These look super tasty, with their chewy caramel layer and everything – I’d have probably eaten a whole pan after going through what you did! The weather has been absolutely terrible! I was really scared this week two days in a row. We need some sunshine and warmth. But I guess we all might just have to settle for these bars! I sent you a text on Monday to make sure you knew you were in danger and needed to get somewhere safe. Although I knew your phone wasn’t working so wasn’t sure if you’d get it. So glad you’re okay – what an exhausting week! Chelsea, that is so scary! I’m so glad you guys are ok!!! Good thing you had these bars to comfort you. They look so delicious!! I’ve never tried Lancaster candies before – they look great, I love the swirl! How terrible! Thank goodness your family and your house are ok. I’ve never experienced a tornado, and I’m pretty sure if I was in your position I would have just completely freaked out in my car! These bars look like the perfect thing after a super stressful scary situation! I am so terrified of tornados! When I was in grad school one touched down just a few miles from my apartment. It was so scary! It was the middle of the night and I was living alone. The sound was just unreal. I’m glad that you are ok, and that your house is ok! And these bars look so good! I’m so glad that you and your little one made it home safe! I can’t imagine being caught out in a storm like that, and with no phone nonetheless. So scary. These bars look seriously amazing. Browned butter, caramel, butterscotch, vanilla, and sea salt! Could you have fit any more awesomeness in there? Oh my gosh I’m so glad you made it through that unscathed! These bars seem perfect to get through that. These sound incredible and look so gooey and delicious. wow love the salted caramel. these look amazing! phew, sounds like you really got lucky with that rain situ Chels!! hopefully your friend will be settled again soon 🙂 as for this cookie bars, my god these look decadent!!! 100% pinning! Wow! So glad you made it through all of that in one piece. :O It sounds like quite the ordeal. On the bright side, these bars look delightful! I love all the flavors going on in this one awesome bar!